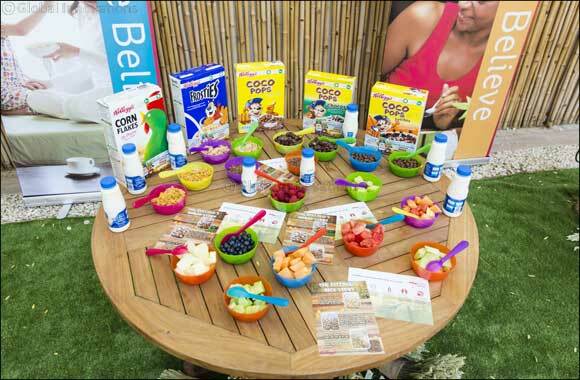 On 13 December, Kellogg’s hosted a farm-themed family event – designed to provide attendees with in-depth insights into the journey of its breakfast cereals from the field to your family breakfast table. The event took place in a private garden in Al Barari – Dubai’s exceptional botanic haven – and brought together more than 12 mothers and children. Attendees truly indulged in the farm-like ambiance, complete with haystacks, decorative sunflower seeds, and a barnyard play area. The event proved to be an engaging experience from beginning to end thanks to a slew of fun-filled activations including interactive entertainment and animation for children and a professional family photo shoot. Kellogg’s nutritionist Hala Barghout was also on hand to give an insightful presentation on the story of Kellogg’s cereals – which begins in a field with a single grain of corn, wheat, oat or rice, and continues right through to the family breakfast table. In fact, the journey starts with dedicated farmers who grow these grains in the span of approximately six to ten months. They basically plough the fields and plant the seeds then wait for the first sprouts to appear and turn into crops. Interestingly, it can take 1,000 hours of sunshine to grow a single grain for Kellogg. From there comes a cooking process that takes less than two hours. Depending on the cereal that is being made, the grains are either shredded, puffed or flaked. Next, they are toasted, mixed with other cooking ingredients and enriched by a variety of minerals and vitamins. Finally, everything is packaged so you and your family can enjoy a delicious breakfast meal!